On the Friday of my Yorkshire knitting Tour we visited Haworth, home of the Brontë sisters where they wrote their famous novels, and where several of the sisters and their one brother died. While there we had a guided tour of the village and a talk in the Brontë Parsonage Museum about the Brontë family. I am, of course, particularly interested in the knitting sheaths in the museum collection, of which there are five! 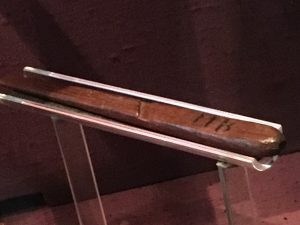 Currently two of these are on display at the Parsonage; a flat wooden one inscribed M. B., which we can reasonably assume belonged to Maria Brontë, the sisters’ mother. However, it is also possible that it belonged to Maria Brontë junior, who died at the parsonage of tuberculosis, a consequence of harsh conditions at Cowan Bridge school. This is so close to the story of Lowood school in Jane Eyre, that it is generally agreed to be the inspiration behind that part of the book. 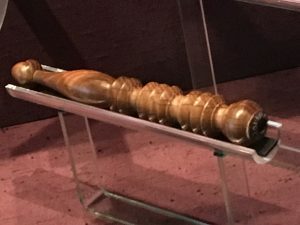 The other knitting sheath on display is a turned wooden one, typical of the spindle sheaths that were used in the indistrial part of the West Riding. A ‘West Yorkshire spindle’ sheath that is almost exactly like this is illustrated (a drawing) in Peter Brears 1980 article identifying regional styles of knitting sheaths. That one is from Oxenhope, a village neighbouring Haworth, and belongs to York Castle Museum. 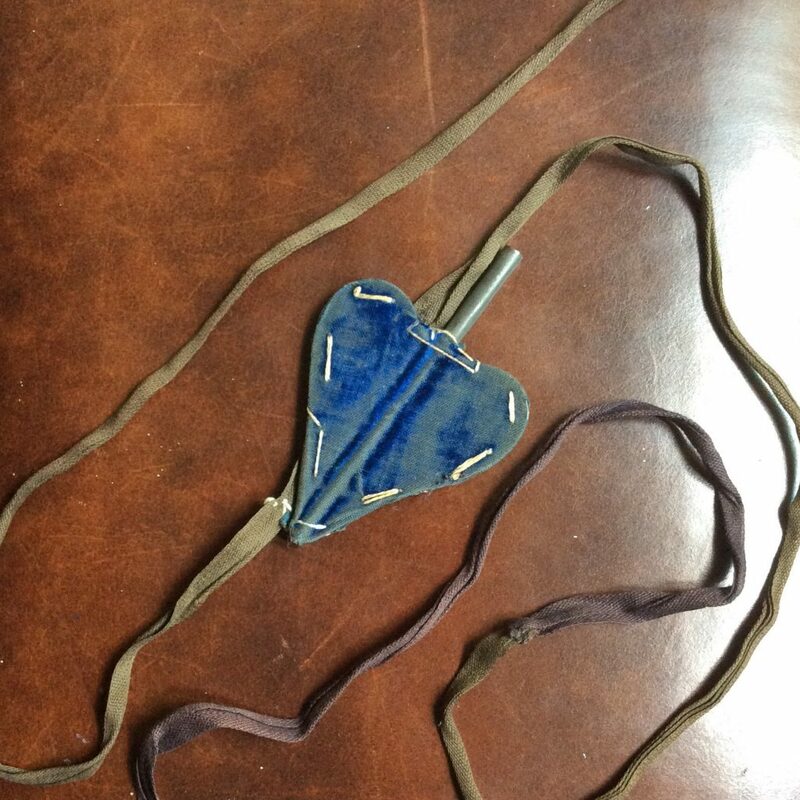 Presumably the two sheaths were by the same maker. ← Where Did Mary Allen Live? I wish we could all get a summary of your blog write ups to remember where we went and everything we saw! I have my pics but can’t recall it all. I’ll pull one together for you!